Green Care Finland ry, established in 2010, works to coordinate, develop and promote the use of nature and animal assisted methods in combination with wellbeing and health services in Finland. In Finland, two distinct domains are distinguished, Green Care and Green Empowerment. The clients of Green Care (in Finnish, Luontohoiva) typically include vulnerable groups such as the elderly, immigrants, mentally and/or physically disabled. These services are given within the prevailing legislation of health care and social services. The services of Green Empowerment (in Finnish, Luontovoima) include activities supporting the overall mental and physical wellbeing of all people. The activities can be considered as preventive measures: they are typically conducted by organizations concerned with wellbeing or nature tourism. Elsewhere in the world also terms like Farming for Health, Social Farming, Care Farms, Inn på tunet, Groene Zorg and Grön Omsorg, are used to describe similar activities. 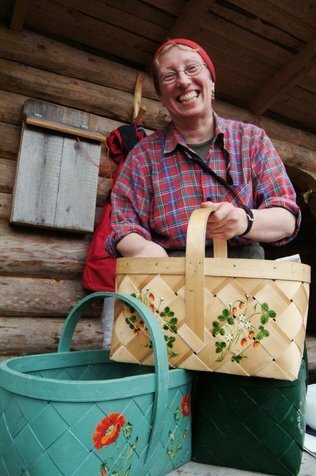 One could say that Finland draws from green empowerment, as its history and folklore have their roots in strong nature relationship dating not so far back. Still today, the mainstream Finn is an outdoorsy individual, familiar to all types of weather through outdoor sports and recreational activities. According to the survey by Finnish Forest Research Institute (2011) the favorite outdoor activities are hiking in the summer, cross-country skiing in the winter, picking berries and mushrooms or simply walking in the woods. Approximately 65% of Finland’s total land area is covered in forest. All of the country’s forests are publicly accessible under the law of everyman`s right, which guarantees all inhabitants the freedom to move around. Finns are fortunate to enjoy a pure and clean natural environment. Walking in Finnish nature not only refreshes and relaxes the brain, but also frees the spirit. Regular visits to the forest have been proven to lower blood pressure, detoxify the body and improve people’s overall mood. The surrounding silent nature promotes relaxation and decreases stress. Lack of noise and especially the darkness of wintertime promote good, reinvigorating sleep that help us face the challenges of everyday life. Hiking Travel Hit is an enterprise located near Tampere. VisitFinland.com provides information about the available services for outdoor activities and relaxing. NationalParks.fi provides up-to-date information on the national parks and Metsähallitus' other hiking destinations and their facilities. Several methods are used to conduct Green Care activities. 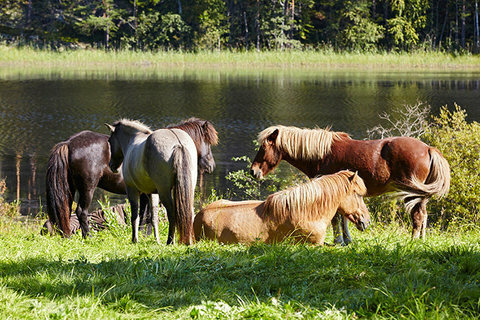 Riding therapy is the best known animal-assisted therapy in Finland. It encompasses activities with horses and other equines to promote physical, occupational, and emotional growth in persons with different disorders such as ADHD, anxiety, autism, dementia, depression, drug and alcohol addiction, and other mental health problems. Socio-pedagogical horse activities are also commonly used. Purola Farm organizes a variety of activities with Icelandic horses including social pedagogical horse activities. Other animals are also used in animal assisted therapy (AAT) and activities (AAA). Dog assisted intervention is based on interaction between the dog and the human being. The dog can accompany a health and social care worker as well as people in the field of education. Cats and dogs are also frequent visitors at nursing homes and care facilities. Increasing interest is being shown for the use of cattle, goats, sheep and chickens in animal assisted therapy and activities. Several studies have shown the clear positive effects of nature on human health. The calming affects of nature can be measured by heart rhythm, blood pressure, amount of stress hormone levels in blood and muscle tension. Walking in nature has been established as an effective way to manage stress. Nature is also used as a therapeutic environment in care and rehabilitation. Examples of nature assisted methods include adventure education and ecopsychological interventions. Eco-psychology provides also several important theoretical elements for Green Care activities. Humans are seen as a part of nature, meaning that human well-being is interlinked with nature's well-being. The theory seeks to reconnect humans with nature and support them in adopting a sustainable lifestyle. Biodiversity (i.e. species diversity) supports and promotes cultural diversity and human resilience. Besides providing memorable experiences, gardening and activities in a green environment can provide work, activities and possibilities to practise specific skills. In horticultural therapy, activities are used for practising specific physical or psycho-social capabilities. In social and therapeutic horticulture gardening activities are also used to social goals such as integrating people in society. Care farming (or social farming) is an essential part of European Green care activity. Finland only has few farms active in care farming. At the farm, care of animals as well as the season bound activities of cultivation provide the opportunity to relate with nature. Joint activities and following a daily rhythm of the farm support the rehabilitation process. Forestry activities can also be used for the same purposes. The association wants to highlight the right of people with impaired physical or mental abilities to nature, physical exercise and social relationships. We are contributing to the interdisciplinary networking of professionals. Currently, Green Care is focusing on developing the quality management work. As the first basis of quality management, ethical principles were established, and now, speciic trade mark for quality will be launched. Regardless of its young age, the association has already created a diverse network of actors both nationally and at professional level. The association is growing steadily as the interest for these activities are constantly booming. Kosloff, Johanna 2017. A Rehabilitative and Recovering Garden. Hørhaven Danmark.